We are driven by the simple goal to make environmental risk data clearer, more accurate and realistic. 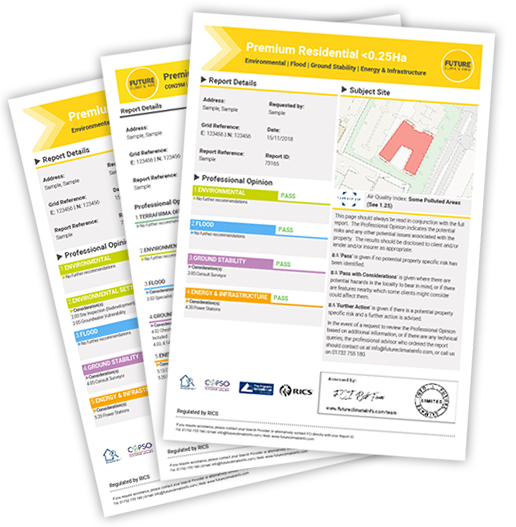 We launched in 2014, following feedback from property professionals, who wanted a clearer more comprehensive search for residential and commercial conveyancing. The result is a step change in report content that more closely meets market requirements – providing clear insight and opinion, with a more forensic view on environmental risk. If your client has a potential issue, you can talk to our seasoned experts who can give you individual advice and guidance at the highest technical level. Geoff is a pioneer of mining and environmental risk data; setting the national standards in the public and private sector in the UK and overseas. At British Coal and the Coal Authority, Geoff led the team that built the national coal mining database and the coal mining reports system, setting the benchmark for the coal mining reports used today by the Coal Authority and its licensees. Working closely with the Law Society, Geoff was principal in developing CON29M. As a Director of Landmark Information Group companies in the UK and Europe, Geoff led the development of environmental due diligence reports for property professionals in the UK and The Netherlands, and was instrumental in developing software based real estate appraisals for the German lending banks. Chris started out as an environmental consultant and environmental data specialist, helping to establish Groundsure. He was responsible for growing the business, developing automated risk assessment methodologies and running the environmental consultancy team. He co-founded Argyll Environmental Limited providing a wide range of environmental consultancy and environmental searches to quality management standard ISO 9001. He is a Specialist in Land Condition (SilC) – one of very small number of environmental experts in the UK – that meet stringent standards of professional excellence in the assessment of the condition and remediation of brownfield sites. Chris has worked extensively in business strategy, environmental consultancy and risk modelling for contaminated land and flood risk and site drainage data. His key area of expertise is product development for due diligence reports both in the UK, Europe and South Africa. Penny has worked extensively in property and investment, site management, development and regulation. Her expertise is principally in environmental risk and waste management, civil engineering, quality management systems, auditing report methodologies, and planning and development. She is a Chartered Environmental Surveyor and a Chartered Environmentalist. She is highly experienced in producing environmental risk and impact assessments for due diligence, residential and commercial property transactions. Her work has involved a large number of contaminated land investigations. Her specialist knowledge of environmental risks and liabilities is also applied to insurance underwriting. During her professional career she has served at RICS Faculty Board level, acted as an APC Mentor, a Board member of the Society for the Environment, and an assessor for professional membership applications. Penny has also been heavily involved in developing and auditing automated environmental risk assessment methodologies across the industry. Trevor Hellawell is a solicitor and legal training and management consultant working with major law firms, local law societies, many legal training providers and other clients. Until going freelance in 1999 he was a full time lecturer with the University of Law, ending his career as a Principal Lecturer at the York Branch. Until recently returning to the freelance arena, he was Head of Law Programmes at BPP. He was formerly a member of the Law Society’s Planning and Environmental Law Committee and is the author of the Environmental Law Handbook, now in its seventh edition. Throughout his career, he has lectured extensively on Professional Conduct, Management skills such as Client Care, Time Management and Appraisals, Financial Services matters, including Money Laundering, as well as mainstream academic law subjects. He was also, until recently, a Business Partner for the Brighter Law Group. Andrew is a solicitor with 30 years experience specialising in environmental and planning law. He was formerly a partner in various law firms prior to joining a public body as General Counsel & Corporate Secretary where he heads the legal, governance and operational risk teams. He was Chairman of DEFRA’s Contaminated Land National Epert Panel and was appointed by the Minister of State to Chair the Advisory Council of UK Export Fiance (ECGD). He is joint editor of the Law Society’s Environmental Law Handbook, author of the environmental chapter in their Conveyancing Handbook and sits on their Planning & Environmental Law policy committee. Neil has been in the property sector for 6 years developing valuable industry experience in face to face consultation with lawyers on their conveyancing due diligence requirements, successfully achieving tangible cost savings for firms and presenting keynote CPD presentations both at external events and in-house, on topics such as Contaminated Land, Flood and Japanese Knotweed. Neil has a unique market insight through working with key players in the industry and helps FCI to ensure products and services are of a high standard. Neil manages our reseller network, a critical part of our business model, ensuring our products and services are available to legal professionals across the UK. Neil’s focus is developing key business relationships, growth in awareness of FCI reports and brand plus ensuring annual revenue targets are achieved. Shane joined the property sector 4 years ago, utilising his background in GIS and spatial analysis to develop data driven solutions to help keep transactions moving forward. Shane is focused on delivering innovative and pragmatic solutions to emerging and existing environmental risks, working extensively with industry leading experts to ensure that FCI’s products are based upon the best available data and interpretation of the risks. Shane is responsible for the development and enhancement of our product portfolio. He also heads up the data team, who deal with the customer service and technical side of the business. Jason has been in the property sector for 15 years and has seen all sides of the industry. He has built up a huge wealth of experience and developed and maintained key relationships within the sector. He always puts his client’s needs as his main priority and is constantly looking to improve service levels, finding where the ‘gaps’ are in the market and where a new product is needed to fulfil client’s needs, whilst making sure that FCI delivers the best service possible to their clients. Jason mainly manages our reseller network in the Southern region, which is a key part of the FCI business model. David is a well known marketing consultant in the property information, environmental risk and geospatial data markets. He has provided strategic support to a wide variety of data businesses, law firms and environmental consultancies. He has a long track record in driving business growth through effective marketing strategy, product launch and communications delivery. Passionate about the environment and a committed geographer, he is widely published through his clients, with a detailed understanding of how climate change is impacting on property and communities.